Credit. RandiOh Designs Happy Holiday Collection Another lo of our twins. I can"t get enough of scrapping them and I love how this collection creates a beautiful bright xmas lo. Isabel Mendez"s Party Time collection has it all for a great fun party lo. Credit: RandiOH Happy Holidays Collections These are my great nieces, Hailey and Hanna. This collections just screams Christmas, with its beautiful colors,elements and sparkles. Credit: RandiOh Shades of Blue Collection RandiOH Sticker Set Collection This picture of Hailey was my inspiration for this quote. Randi beautiful Shades of Blue collection worked perfectly is giving this the girly look. Credits: Randi Oh Shabby Blush Collection I am lucky enough to have these wonderful old pictures and I want to preserve them for other generations.This kit is so versitle and is perfect several different types of layouts. RandiOh Designs Shades of Blue Collection My niece got married in Jamaica and this collection works great for wedding pictures too. So versatile it is. Great LO! I like how you cut the frame to make a journal piece. Very sweet! What cute pics! I love how you edge the tops of the frames. Great LO! So CUTE! I like how you used the pockets and those pictures are adorable. They are just adorable! I love the little pockets on the layout too and how you used the jeans theme to go with their precious overalls. To me, there is nothing cuter than a baby in overalls - especially when they start toddling! What a fun and creative way to use the alpha. Neat idea! Great LO...Love how you used the alpha...just brilliant! I really like your layout and how you did the number line with the things you are thankful for. Very creative! I forgot to say in my other comment how much I like your title for the page too! Wow, just gorgeous! love everything in it. Awesome job Peg. Awww, how cute! What a precious photo and the fun colors and elements in this kit were perfect for it. Great layout! is that the cutest little face? what perfect photos and title - love this LO -- it screams holiday. the title cracks me up and the note.. ooooh love it!! and love all the little touches like the button holding down the swirly ribbons and the stamps, and the candy canes.. ah, so creative! What a creative use of the collection! your clusters are magnificent! they are so amazing and love that you added some stickers from the Digital Stickers in there too it works so well! Super extraction and use of paper IN the frame and that she is holding and smelling the flowers. wow! Love this Layout!! Wonderful clustering. This is just beautiful! Look how cute!!! She's holding the flower! Love that you changed the color in the leaves and laces. The butterfly trail is fab! oh how I LOVE heritage Layouts, this is smashing! .. what a terrific photo to have and to preserve, and I love how you placed it in the book frame... oh and the stickers, great idea! i keep staring at this.. love the way you used the alpha and everything! Fantastic page! Ooh love the doubled lace and tag! Love the old pictures...it is wonderful to preserve those memories and history. Wow! This is beautiful! I love how you layered this beautiful page! You are so lucky to have these to scrap! this is wonderful!! Gorgeous! I love how you highlighted the photo with the brackets. It looks great! this is BEAUTIFUL!! and something blue for the wedding :) I LOVE this -- fabulous placement and the brackets to focus on the photo is great. Love the way you used the kit and the b/w photo and the tag!! Great LO...I love the details such as your use of the tag. Very cool. How lovely!! and of course lucky people to be married in Jamaica!! This is really pretty!! If you missed the side walls you can see them here in part 1. 3. Dark pink for the door: Take your front measurement and subtract 4 inches. Divide that number by three for the door width. For the height I just subtracted 4 inches. 4. 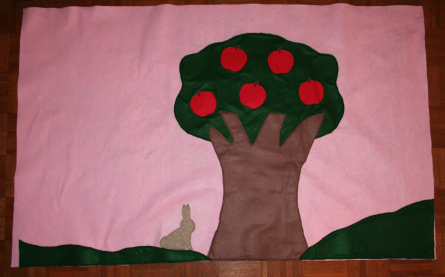 Various colors for the elements (red, white, gray, green, black): We used red felt squares for the apples, some scraps from the other pieces and projects for the rest. 5. A big piece of white for the roof. Measure the table top and add 6 inches to each side if you are making a scalloped edge. You can download the outline designs for part 2 here. 1. Cut the Tree out. Cut strips of Heat and Bond Ultra and iron them on. Let cool and remove paper. 2. Pin the tree top in place and iron on. Sew around the edge. Repeat for the trunk. 3. Embroider a bunch of the apples: Hoop felt squares (I did not use any stabilizer on these.) Embroider the apples Remove from the hoop and cut around the apples. 4. Trace the apples on Heat and Bond Ultra. Cut out and iron on. Let cool and remove the paper. Position the apples on the tree and iron per the Heat and Bond Ultra instructions. 5. Use leftover felt to create grass at the bottom if desired. Adhere using strips of Heat and Bond Ultra and sew around the edges. 6. Embroider the bunny. Cut around the stitches. 7. Trace the bunny on the Heat and Bond. Cut out and iron on. Let cool and remove the paper. Position the bunny and iron per the Heat and Bond Ultra instructions. 8. Cut the bush out. Cut strips of Heat and Bond Ultra and iron them on. Let cool and remove paper. 9. Pin the bush top in place and iron on. Sew around the edge. Repeat for the trunk. 11. Trace on Heat and Bond Ultra. Cut out and iron on. Let cool and remove paper. Position the light pieces and iron per the Heat and Bond Ultra instruction. 13. Embroider the mailbox. (I embroidered the outline twice and the words and heart only once.) Cut around the stitches. 14. Trace the one without the words on the Heat and Bond. Cut out and iron on. Let cool and remove the paper. Position and iron per the Heat and Bond Ultra instructions. 15. Pin the front mailbox piece on top and sew around the sides and bottom creating a pocket for mail. 16. Embroider the door handle. Cut around the stitches. 17. Trace the handle on the Heat and Bond. Cut out and iron on. Let cool and remove the paper. Position handle on the door and iron per the Heat and Bond Ultra instructions. 18. Cut a square of white for the window. Cut out the center creating a window frame for the door. Cut strips of Heat and Bond Ultra and iron on. Let cool and remove the paper.Position the window on the door and iron on. Carefully cut the felt out of the window frame creating a window. 19. Position the door. Sew across the top at least three times to secure. Mark 2" in on each side of the underneath felt and cut out the felt underneath to create the door opening. 21. Mark the sewing line on the inside top of each wall. Mark the roof inside all the way around. Lay the roof out flat on the floor with the inside facing up. Pin a wall face down matching sewing lines. Roll up and secure the rolls like you would a large quilt. Sew along the line leaving the inch at the overlapped corners open. (If you are making one this large sew again about 1/8" from the first seam for extra strength.) Repeat for each wall. 22. Secure the sides. 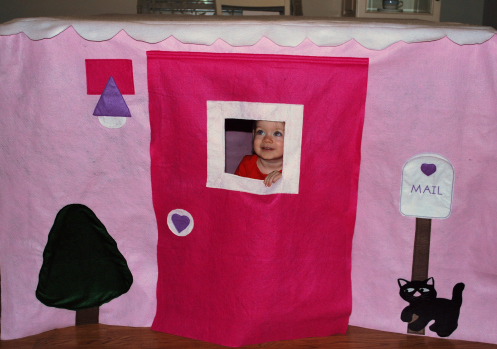 If you are making a smaller card table size playhouse you might just sew down the sides. Ours was so big that we just put a couple of buttons and button hole on each side to make it easier to put on and take off. Note: The kitten on the front came from an appliqué quilt pattern so I cannot share it. Here is a set of twenty free ones you could choose from. Well, Christmas has come and gone and the girls are having a great time in their new playhouse. If you have boys make a gargage or a stable or an army fort. I may make the stable (not in such a big size) for my house since the playhouse was such a hit. I hope you had a great holiday and wish you a blessed new year in 2012. This is really terrific! While it is a little work, think of the hours of fun for everyone.